Daisaku Ikeda (ja: 池田 大作 Ikeda Daisaku; January 2, 1928–) is the president of the Soka Gakkai International (SGI), a Buddhist association of more than 12 million members in more than 190 countries and territories, and founder of several educational, cultural and research institutions. Born of poor origins, his family endured the hardships of the war, as many did. In his youth, he lost an older brother to World War II, which developed in him a strong opposition to war. In his late teens, he learned of Nichiren Shoshu Buddhism through Josei Toda, a Nichiren Shoshu Buddhist, peace activist, and then president of Soka Gakkai. 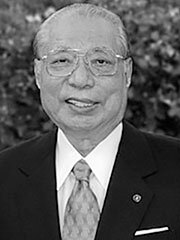 As a disciple of Toda, Ikeda took on Toda’s dream and mission to spread the teachings of Nichiren Buddhism and its principles of developing a peaceful world through the individual development of each human being, one person at a time. Following Toda’s death, he became president of the Soka Gakkai from 1960 to 1979, when he was succeeded by Hiroshi Hojo. From its beginnings in the 1930s, the Soka Gakkai was a lay organization whose role was to support the laity in their practice of Nichiren Buddhism. Following World War II, as Nichiren Buddhism, primarily, the Nichiren Shoshu school, began to spread throughout the world, Soka Gakkai responded by developing an international outreach program, the SGI (Soka Gakkai International). Ikeda took a lead role in this development, and named himself the honorary president of SGI upon its founding in 1975, and remains in that position to the present (as of 2005). As the president of this international Buddhist organization, Ikeda (who holds a number of honorary doctorate degrees) has used the principles of Nichiren Buddhism throughout his own life, and in his role as president of SGI, he acts to support the membership in a number of ways, including providing support and encouragement through his writings and lectures, by striving to promote a global dialog on Nichiren Buddhist principles as they apply to today’s global challenges with many of todays world leaders. As such, the SGI membership views him as a great role model for how to apply this practice in their own lives. He is fondly referred to by followers as their mentor, or «mentor. Nichiren Buddhism is a form of Buddhism based on the final teachings of Shakyamuni Buddha, in what is called the Lotus Sutra. The basic premise of this teaching is that Buddhahood and enlightenment are states of being that are as innate to each and every human being, as are the more commonly experienced states of, say, anger, hunger (as in greed, thirst, or insatiable desire), or tranquility (as in calm,complacent, or satisfied). According to the Lotus Sutra, not only are all human beings equally endowed with the potential for enlightenment, but so are they potentially capable of attaining this state, with in the current lifetime. According to Nichiren Buddhists’ interpretation of the Lotus Sutra, one may awaken their «Buddha Nature» through a meditative practice of chanting the phrase, «Nam myoho renge kyo,» to develop one’s sense of compassion, wisdom, and clarity of mind, and through the development of a sense of the interconnectedness of all life — the «oneness of man and environment,» or esho funi — and the ways in which ones’ thoughts, actions, and deeds, or karma, act to effect one and his or her environment, in the past, the present and into the future. Ikeda and his predecessors in SGI, Toda and Makiguchi, and the founder of Nichiren Shoshu Buddhism, a medieval priest named called Nichiren Daishonin, all strived to live according to these, and other Buddhist principles, and to encourage others to do the same. Through the study of their teachings, the practice of chanting, and the practice of active involvement in the world at large, one is thought to be able to develop the innate ‘Buddha Nature» within, leading to a happier, more fulfilling life for oneself and others. In spite of a host of accomplishments and recognitions, as cited below, he remains a controversial figure. For example, it must be noted that for some English speakers, the concepts of «mentor» and «disciple,» (important concepts to his followers), have negative connotations, and are thought to imply a relationship of superiority and inferiority between individuals. This terminology has been a point of contention and suspicion for many people. However, Ikeda, the SGI, and his followers use the terms as they are defined in standard English language dictionaries. Thus, a «mentor» is considered a teacher or guide, and a «disciples» is one who accepts or adheres to the teachings of the mentor, and acts to apply these teachings within, and through his or her own life. In this equation, there is no inequality in status; one is neither superior or inferior to the other. In the case of Nichiren Buddhism, as it is practiced within SGI, mentor and disciple strive side by side to apply Buddhist philosophy in daily life. Ikeda has also been linked with various accusations that have been made about Soka Gakkai’s activities in another contentious point of controversy. However, theses accusations were by most part invented by the Liberal Democratic Party, Yamazaki and the media. Followers maintain that the SGI promotes and insists upon the utmost appreciation and respect of each individual’s life regardless of social status, gender, race, lifestyle, religious or political beliefs. Ikeda is a prolific writer, poet, peace activist, and interpreter of Nichiren Buddhism. He has traveled to more than 50 countries to hold discussions with many political, cultural, and educational figures, as well as to teach, support, and encourage practitioners of Nichiren Buddhism living in these countries. Topics he has addressed include the transformative value of religion, the universality of life, social responsibility, and sustainable progress and development. As a mentor of SGI, he has founded several institutions, such as the Soka schools (from kindergarten through university level), the Min-On Concert Association, the Komeito and the Tokyo Fuji Art Museum, in order to promote educational, cultural and artistic activities and conduct exchanges with like groups and institutions on a global scale. Ikeda has also initiated a wide range of grassroots exchange programs and delivered speeches at a number of institutions of higher learning around the world, including Harvard University, the Institut de France and Beijing University. Ikeda, who is usually referred to as Mr. or President Ikeda, has received over one hundred honorary doctorates from universities around the world. These include docotrate of letters from University of Delaware, Morehouse College and Queens College of the City University of New York, in the Unted States. International conferrals include University of Glasgow (UK), Moscow State University, Sofia University (Bulgaria), University of Buenos Aires (Argentina), Ankara University (Turkey), University of Nairobi (Kenya), University of the Philippines. He has honorary professorships from many universities, including Beijing University and National University of San Marcos (Peru). For his humanitarian endeavors in a range of fields, he is the recipient of numerous awards, including the United Nations Peace Award, National Order of the Southern Cross of the Republic of Brazil, Honorary Cross of Science and the Arts from the Austrian Ministry of Education, Medal of the Grand Officer of Arts and Letters from the French Ministry of Culture, the Grand Officer award from the President of the Italian Republic and the World Poet Laureateship from the World Poetry Society. Founder of Soka University, the Soka School System, the Boston Research Center for the 21st Century, and the Toda Institute for Global Peace Policy and Research, Ikeda is also author of numerous books and has held dialogs on peace, education, and culture with numerous scholars and world leaders. Each year he authors and submits to the United Nations a Peace Proposal. Most notable are his dialogs, such as Choose Life: A Dialogue (English edition, Oxford University Press, 1976), in which Ikeda and historian Arnold J. Toynbee discuss «humanity’s predicament in all its aspects.» More recently, in Planetary Citizenship: Your Values, Beliefs, and Actions Can Shape a Sustainable World (Middleway Press, 2003), futurist Hazel Henderson and Ikeda «explore the rise of ‘grassroots globalists,’ ordinary citizens all over the world who are taking responsibility to build a more peaceful, harmonious and sustainable future.» He is also the recipient of the most honorary doctorates awarded to a single individual, including the United Nations Peace Award, the International Tolerance Award of the Simon Wiesenthal Center, and the Rosa Parks Humanitarian Award.